Google has updated its Android Distribution Numbers, a statistical chart which it updates once a month, to highlight the usage percentage of each version of Android, that users use to visit the Play Store. Though it is intended to be used by developers, who can analyze it to see which API level to target, it is also a valid way to see the usage share of the latest versions of the Android OS. When it comes to version based OS shares, Android is seriously an embarrassment, thanks to its incredible fragmentation. Most OEMs have their own custom skin of Android, with some bloatware, and take their own sweet time to update the firmware. Or they simply skip it entirely. Google, for some reason did not update the chart last month, for the September-October timeline. Now, to the Android Distribution Numbers of November 2016. Android 7.0 Nougat has officially made its debut on the chart, with a meagre 0.3%. 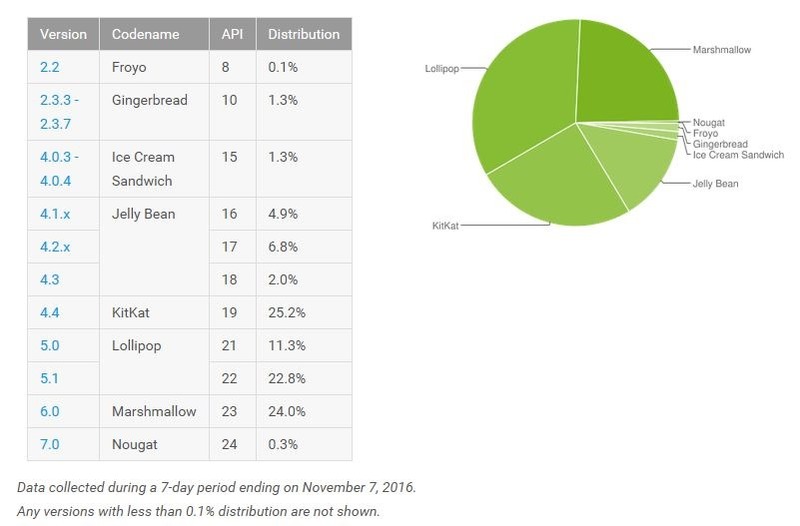 Its predecessor, Android 6.0 Marshmallow holds a 24% share, the second highest for a single version of Android, behind Android 4.4 KitKat which has 25.2%. The chart topper is the OS from 2014, aka Android Lollipop, with versions 5.0 and 5.1 totalling to 34.1%. Jelly Bean (4.1 4.2 and 4.3) totals to 13.7%, Ice Cream Sandwich (4.0.3 and 4.0.4) and Gingerbread (2.3.3 - 2.3.7) have 1.3% usage shares each, while Froyo (2.2) has the least shares with 0.1%. Nougat's low numbers can be attributed to the fact that it debuted a couple of months ago, and is only officially available for some Nexus devices as well as Google's latest flagships, the Pixel and Pixel XL. Marshmallow's numbers while low, is actually quite impressive because it gained almost 6% of shares from September (when it had 18.7 %). This is mostly due to the fact that OEMs have been selling Phones with 6.0 out of the box. The fact that Lollipop's numbers dropped only by 0.9% in two months (from 35 to 34.1), is the worrying factor, which stands as proof of the fragmentation, that is Google's Kobayashi Maru (Captain Kirk's unsolvable problem).